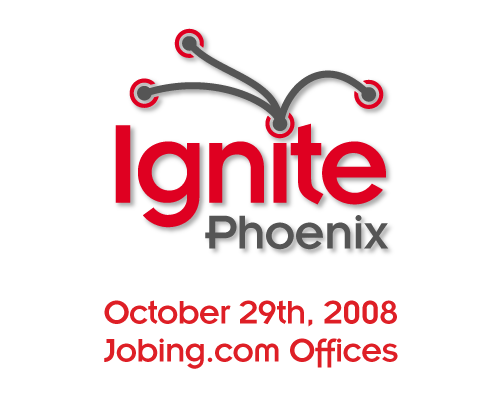 I’m extremely fortunate to be an Ignite Phoenix Evangelist and alumnus for several reasons. First, the concept for Ignite Phoenix is great—inspire the Phoenix-metro community by sharing something of value and something you’re passionate about. Second, attending and/or participating in Ignite Phoenix is a great way to network with like minded individuals who are looking to vitalize Phoenix’s business, art, and creative sectors. Last but not least, you will always learn something new that will hopefully benefit your career or entrepreneurial endeavors. So here’s how local Entrepreneurs can help. Ignite Phoenix is currently taking idea submissions for our October 29th, 2008 event. To submit an idea for a presentation, simply head on over to the Ignite submissions page before 5PM on October 10th and leave your name, website, a short bio, and a brief two to three sentence explanation of what idea or passion you would like to share with everyone. If your idea makes the cut, you’ll get five minutes and 20 slides to talk about anything and everything you want. If you think I’m kidding, then know that our inaugural August 12th event had presentations on peanut butter and jelly, OCD, green business ideas, fire walking, social media, and being the only black guy in the room. You DO have ideas to share! – Here’s the deal, a lot of people I talk to think that they have nothing interesting to talk about and then proceed to spend 10 minutes telling me about all the things they can’t talk about—that’s two presentations worth of ideas right there! How to NOT pitch your idea! – Think of your idea submission like an elevator pitch, tell us what you would like to talk about and why your idea would be of value to Phoenix. On the other hand, do not submit a sales pitch! For example, lets say you started Phoenix’s first naturopathy clinic that uses Açai berries and cheesecake to cure all ailments. Instead of talking about why your clinic is the best and how the audience will benefit from your remedy, talk about what inspired you to seek out such a radical solution and how this process of exploration could help other individuals find breakthroughs in their own businesses or careers. Or lets say you started a green delivery business, instead of persuading the audience to use your delivery business, show them how you ‘greened’ your business and how they can green their business, home, or office using the same process. Help spread the word and attend! – If you have given up on the idea of submitting but know someone who has a killer idea, story, or passion to share then please send them this info! Also, show up on October 29th and be a part of the audience; you’ll have networking and learning opportunities all around. By the way, this event is about sharing things of value so I encourage you to submit an idea even if it’s not related to business or entrepreneurship. I also hope you seriously consider attending the event, you won’t regret it! Post Scriptum: You can keep up with all the event details by subscribing to the Ignite Phoenix blog or joining us on the Ignite Phoenix Facebook Group.